Good morning. This is David Baits, Superintendent of Fairbanks Local Schools. Today is Wednesday, February 20, 2019. Fairbanks Local Schools will be closed today. Thanks and have a great day! You're invited! Please join the Board of Education on Monday, February 25, 2019 from 6:00PM-7:00PM to welcome our new superintendent, Adham Schirg and his family! The Welcome Reception will be in the MS/HS Media Center. This is Mark Lotycz, elementary principal at Fairbanks Local Schools. Today is Monday, Feb. 11th and Fairbanks Schools will be on a two hour delay. There will be no morning preschool. Thank you and have a good day! Good afternoon! This is David Baits, Superintendent of Fairbanks Local Schools calling about a make-up day. Friday, February 1st was our 6th missed day of school this year. The district will follow the make-up schedule at the bottom of the Board approved 2018-19 calendar. Thus, Friday, February 15, 2019, is now a regular day of classes for all students in grades K-12. There will be no pre-school classes on this day. School buses will run their regularly scheduled routes. Thanks and have a great day! Good morning. This is David Baits, Superintendent of Fairbanks Local Schools. Today is Wednesday, February 6, 2019. Fairbanks Local Schools will be on a 2-hour delay today. Morning pre-school is cancelled. Thanks and have a great day! Good morning. This is Mark Lotycz, elementary principal at Fairbanks Local Schools. Today is Friday, Feb. 1st and Fairbanks Local Schools will be closed. Thank you very much and have a great day! Good afternoon. This is David Baits, Superintendent of Fairbanks Local Schools. Fairbanks Local Schools will be closed on Thursday, January 31, 2019. All after school activities are also cancelled for Thursday. Thanks and have a great day! Good afternoon. This is David Baits, Superintendent of Fairbanks Local Schools. Fairbanks Local Schools will be closed on Wednesday, January 30, 2019. All activities will be cancelled for the day. Thanks and have a great day! Good morning. This is Mark Lotycz, elementary principal of Fairbanks Local Schools. Today is January 24th and Fairbanks Schools are closed. Thank you and have a good day. Good morning. This is David Baits, Superintendent of Fairbanks Local Schools. Today is Thursday, January 24, 2019. Fairbanks Local Schools will be on a 2-hour delay today. Morning pre-school is cancelled. Thanks and have a great day! Good afternoon. This is David Baits, Supt. of Fairbanks Local Schools. Fairbanks Local Schools will be on a 2-hour delay, Tuesday, January 22, 2019. There will be no morning pre-school. Thanks and have a great day. Good morning. This is David Baits, Supt. of Fairbanks Local Schools. Today is Wed. Jan. 16, 2019. Fairbanks Local Schools are now closed for the day. Thanks and have a great day! Good morning. Fairbanks Local will be on a 2-hour delay today, Wed. Jan. 16, 2019; no a.m. pre-school. Reminder: Early Release & Winter Break. Fairbanks Local Schools will dismiss at 1PM on Friday, December 21, 2018 to begin Winter Break. School will resume on Monday, January 7, 2019. Panthers, we hope you enjoy this break and time with your families! We'll see you in 2019! Good morning. This is David Baits, Supt. of Fairbanks Local Schools. Fairbanks Local is now closed for the day. Thanks and make it a great day. Good morning! This is David Baits Superintendent of Fairbanks Local Schools. Today is Friday, November 30, 2018. Fairbanks will be on a 2-hour delay for all students and staff. There will be no a.m. pre-school. Thanks and make it a great day! Reminder: Fairbanks Local Schools will be on Thanksgiving Break Wednesday, November 21, 2018 - Monday, November 26, 2018; returning to school on Tuesday, November 27th. Have a wonderful Thanksgiving Panther Nation! We are thankful for you! Please note, Fairbanks Local Schools is only on a 2-hour delay, November 15th, with no AM preschool. School will begin at 10:00AM. It was reported in error by a radio station that Fairbanks would be closed. Good morning. This is David Baits, Superintendent of Fairbanks Local Schools. Today is Thursday, November 15th. Fairbanks Local will be on a two hour delay today. Thanks very much and have a great day! Panther Nation, it's time to 'Fall Back!' Don't forget to set your clocks back one hour this weekend. Daylight savings time ends on Sunday, Nov. 4th. FYI for parents with students on Bus 7. The bus is running approximately 20 to 30 minutes behind schedule for drop off today. Don't forget the Community Forum to provide input for the Superintendent Search is tonight (9/20/18) at 7:00PM in the middle/high school Media Center. We hope to see you there! Fairbanks Local Schools will be on a 2 hour delay on Friday, September 14, 2018 due to fog. On Saturday, September 1st, the lights at the football stadium will be replaced. Following the manufacturer's recommendation for the "break in" period, the lights will be left on for 24 hours after the installation is complete. Middle School Back to School night is Wednesday Aug 8 from 3 to 6 PM. All forms must be updated and resigned by parents and students. Reminder: The mandatory OHSAA parent fall sports meeting on Monday August 6 for any Middle School or High School athlete at the High School Football Stadium starting at 6:00 PM. 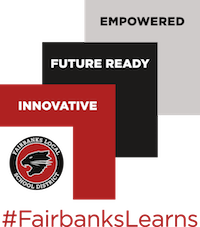 Fairbanks Board of Education will be holding Special Meetings 7/29/18 at 3PM and 7/30/18 at 7PM at the Bus Garage. All documents are now located in one location and can be accessed by clicking Explore - Documents.